Special Purchase Vintage Furniture Click here! Located in Riverside CA, The Gas Pump has provided the public with quality antiques and collectibles since 1982. Bill and Norma Montigel opened the store after retiring and it has done well over the years due to their fine collection, product knowledge and by putting their customers first. After Bill passed away in 1998, Norma and her son Marty kept the store open because Bill would have wanted it that way and because of their love for antiques. 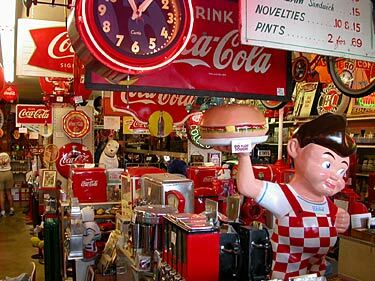 The store has a wide variety of antiques and collectibles that are in excellent condition. All of the antiques work so remember to ask for a demonstration. Please view the different categories to see a sampling of antiques the store has to offer. To find out more about Bill and Norma, please see the "Background" page and the "Directions" page for store information and location. All of the pumps are restored inside & out using the finest paint and materials available. The pin striping is done by hand and the pumps light up. These pumps have been sold to museums all over the world. The store has from 10 to 20 to choose from. The Gas Pump also restores coke machines, candy machines and cigarette machines. Some of the items you will find in the store and inventory changes weekly!